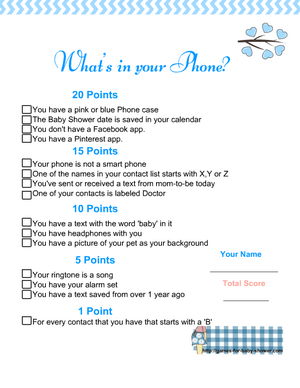 What's in your Phone is a modern version of the classic baby shower game called what's in your purse? This game is getting really popular these days. 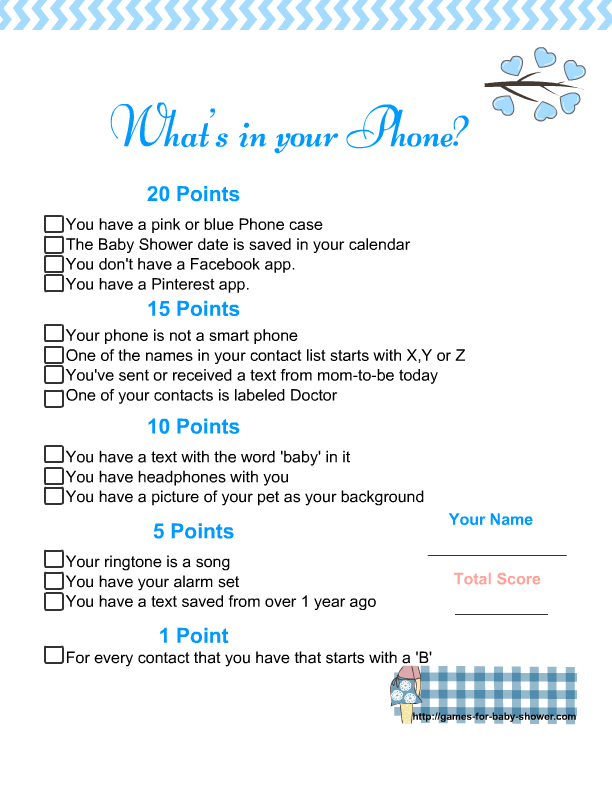 Unlike the what's in your purse game, what's in your phone game can be played on co-ed baby showers as well. On this page I am sharing Free Printable What's in Your Phone? Baby Shower Game in three different colors. You can print this game in any single or more than one color fo your choice for your baby shower party. How to Play: Print and distribute these game cards among the guests with a pen or pencil. Ask the players to take out their cellphones and place a checkmark in all the boxes with the right statements. Ask the players to calculate their score. They have to show the contents of their cellphones to the host on demand. The person with highest score will be the winner. You will have to just arrange a printer and some paper and you can have a great lot of fun on your baby shower party with these adorable games that I have made. This is a printable card for what's in your phone game and it is perfect for a girl baby shower. This adorable game card is decorated with a branch full of pink hearts. To save this image just click on the thumbnail that I have shared above. The bigger printable PNG game image will open up. This is another beautiful color for this free printable baby shower game. This adorable game card is decorated with a blue chevron header and blue hearts. This is another cute color for this fun free printable game. Just click on the thumbnail image and a bigger printable image will open up, you can either save it or print it.